One of the most successful photos of mine from back in the film days is a rather iconic mastigias jellyfish photo from Jellyfish Lake in Palau taken in 2001. This shot was taken with Fuji 100 ISO film and a Nikonos V camera using a 15mm lens while snorkeling the lake in the early morning sun. I believe the settings on the shot were f11 and 1/250 a second or perhaps 1/500th per second (Note to digital photographers, we didn’t have EXIF data back then :P) It was one of a series of photos taken with different speeds and fstops in order to line them up side by side and choose the best exposed image. For years, it was one of my most popular images and has certainly been published many times. However, I always knew that I could have done better if I had used an SLR camera with the ability to actually frame the photo properly instead of using the parallax viewfinder of the Nikonos. The problem I always saw with that photo was that it was off centre in the frame, although I guess I could have cropped that in PS, that is not my style. In June 2011, I was finally able to get the chance to revisit the photo and try again. 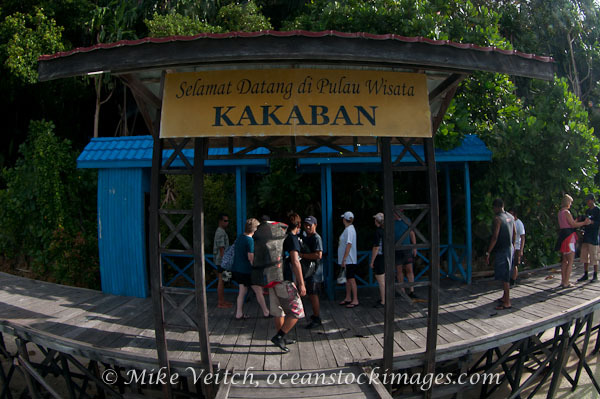 I visited the Jellyfish Lake in Kakaban Island, Kalimantan Province in Indonesia, near the more famous island of Sangalaki. The lake is great as it is much larger than its Palauan counterparts and also seemed somewhat clearer, great photo opportunities abounded! Although there was not the pure density seen at Jellyfish Lake, Palau, the lake was very picturesque and the surrounding mangroves offered great photo opportunities as well. After exploring the lake for a while, I decided it was time to try to recreate my photo from Palau and set about to find a good sized jelly to shoot. Once I found a jelly close to the surface I set my camera (Nikon D90 in Aquatica housing) to 1/500 and f11 (ISO 200) and fired off a few shots. It was apparent straight away that I had nailed the shot in the compositional sense of jellyfish placement in the photo. Through the lens composing sure is a lot easier than a viewfinder on top of the camera! I stuck around and shot several more photos at different focal lengths and all had the jellyfish placed nicely in the centre, the amount of keepers was almost 100% compared to just a few with the Nikonos. That alone has justified my switch to digital some 7 years ago or so 🙂 The one thing that I wasn’t sure about was what the sunrays would look like compared to the original. Well, as you can see for yourself they look pretty darn good, in fact I would say the photo looks much less muddy than the film version (but that is also partly due to the scanning process). 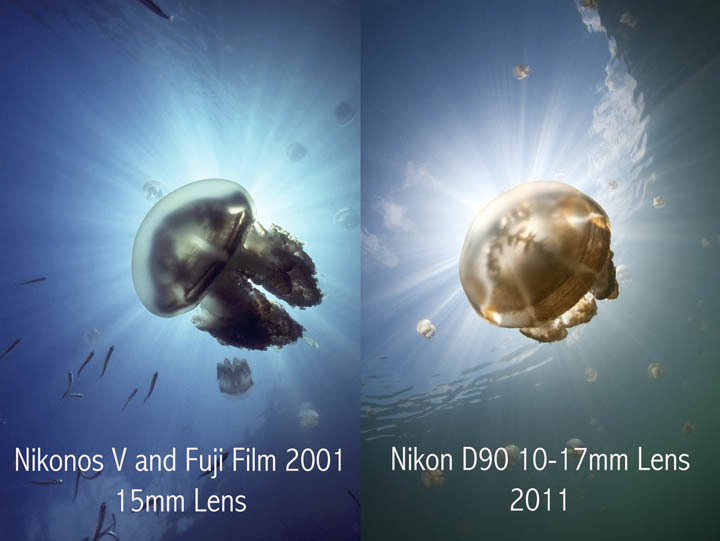 The D90 and other newer DSLR cameras certainly can now rival the sun ray effects of film. Here is a side by side comparison so that you can see for yourself.